Rechecked and amazon still shows it fits, even though it's a 14".?? There is a lot of caliper clearance. It's the offset that is critical. I found another wheelset that I'm running now. They're really light, 0.5" wider and I have 195/50-15 on them. Also, I rarely get more than 50 miles from home, and I have AAA (for my hoopty gasser which the GF uses and we use it for road trips). Do I really need to carry a spare? How could it be secured in the back? I had one slow leak in 43k miles with this car. It was in the sidewall/tread zone and Tirerack was great about getting me a quick replacement. I think I'll stay the course. Thank you for the speedy reply Norton! Stevon had said he'd "I'll let you know after I order it, test it and post it here." so I was hoping for his input as well. I've only had my driver's license 15 years, but I've had about a half dozen or so experiences requiring the use of a spare (call me lucky I guess). 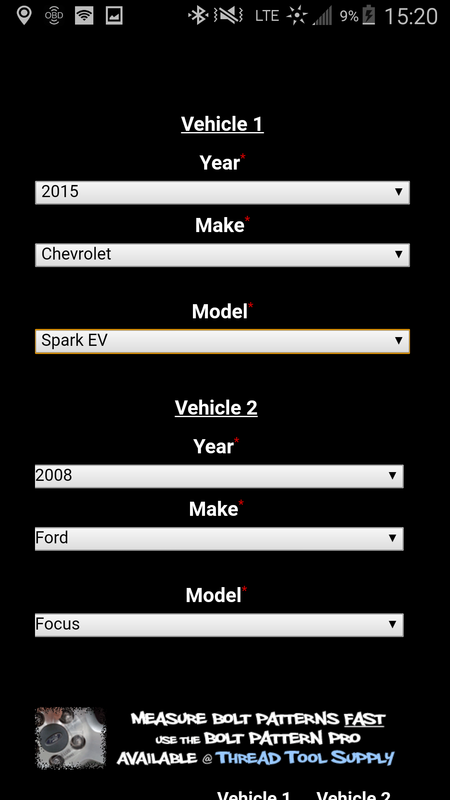 I'm set to take delivery of a 2015 Spark EV next Saturday, so I am seriously exploring options. I appreciate the input and I follow up should I find a good option. 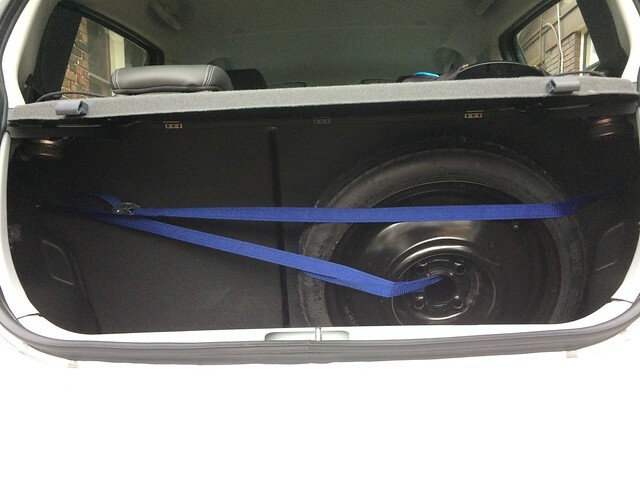 I am NOT recommending anyone do the following but it's my spare tire solution. 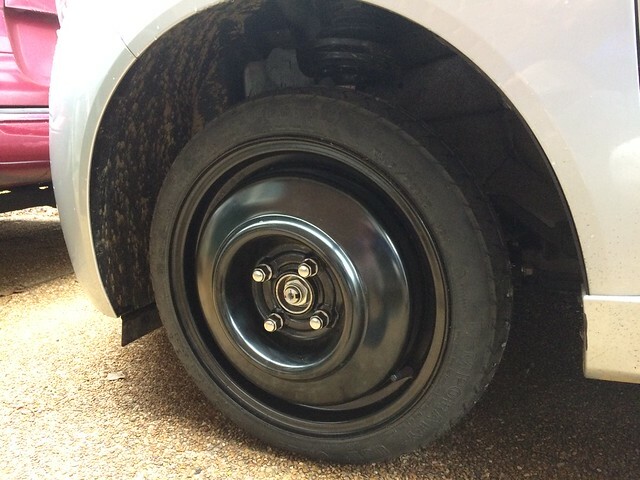 Back in February/March, I bought a Ford spare tire (125/80r15 tire on a 4x108 rim) with a jack and tire iron for $20 from some dude on facebook marketplace. While I knew the rim wasn't correct, the tire was almost a perfect size, it was in like new condition, and both the tire iron and jack worked great too. So I've had this setup sitting in my garage since, and hadn't done anything with it until today. I wasn't having much luck in my search for a 4x100 15" rim with the proper bore (56.6mm) at a reasonable price, and I was thinking of buying one with a smaller than needed bore, then having it machined (or enlarged with a sanding cone), but this morning my El Cheapo conscious decided that nobody was probably going to buy my spare 4x108 rim, so what do I have to lose by elongating the lug holes by 4mm each and seeing if it would mount decently? And it did. I used a conical grinding bit to taper the lug holes. Everything looked satisfactory to me to test drive it. I put it on the back and even though the bore on the rim was a bit larger than necessary, the gap was even all the way around, maybe off somewhere to the tune of less than .005" (not visible to the eye). I drove for 6 miles with no problems or noticeable difference (up to 55mph, full size tire stowed behind my seat, which could still travel to the rear-most position). I then did the same with the spare installed in the front. Again, no problems, regen worked fine. After all the excitement, and returning wheels to their respective places, I got started finding a place for my jack and tire iron. With a dremel tool, I crudely created spaces in the foam under carpet in the hatch (the bottle of tire goo actually has the surround foam cut all the way through so it actually rests on the sound deadening material below. I promised I'd share a "good" solution, but this, even though it works, is a bit half baked. With the proper rim, a storage bag for it, a way to secure it (not just the seat retaining it), a hot knife/wire to cut the foam, and a good bit of skill, it could be the best solution possible. But it will get the job done !! Just drive easy and get the tire fixed. The one time I got a flat in a Volt, it was a loaner Volt (bc mine was giving the local techs a hard time), and it was Sunday afternoon at the Lake of the Ozarks. 140 miles from home. I have a video of the white goo spurting out onto the gravel drive at the Lake House. So, Monday morning a tow truck hauls it and me to a local Chevy dealer 35 miles away and fortunately they had a tire in stock. It didn't cost me anything, except for burning an extra day of vacation time. I did get a small leak in the edge of the sidewall on my Spark EV. It looked like a piece of bone. Really new tire. Wasn't repairable. Tirerack sent a replacement quickly and I limped with the slow leak for a few days. I didn't pull out the white goo that time. 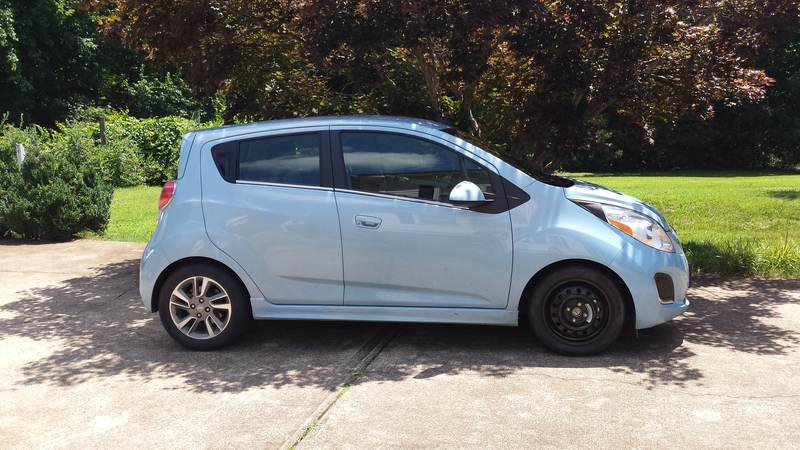 We are about to purchase a Spark EV and would like the spare tire for piece of mind. I had a couple questions on logistics of this if anyone can help. Could you order a compact spare tire that fits the rear and carry around a wheel spacer in case it needed to go on the front? Or if a front tire goes flat a rear tire could be put on the front (with the spacer) and the spare used on the rear? 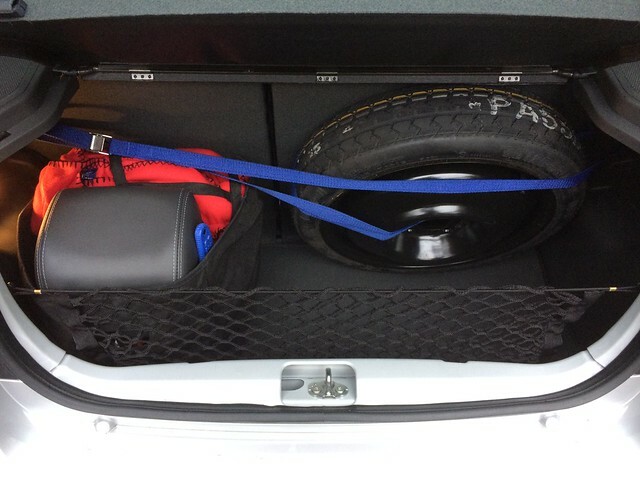 Also are there any tie down anchors in the back of the car that would allow the tire to be secured to the car in some way? 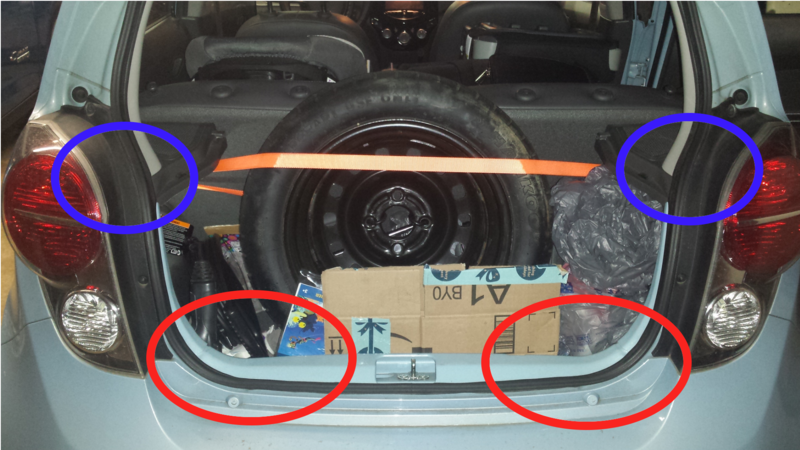 are there any tie down anchors in the back of the car that would allow the tire to be secured to the car in some way? 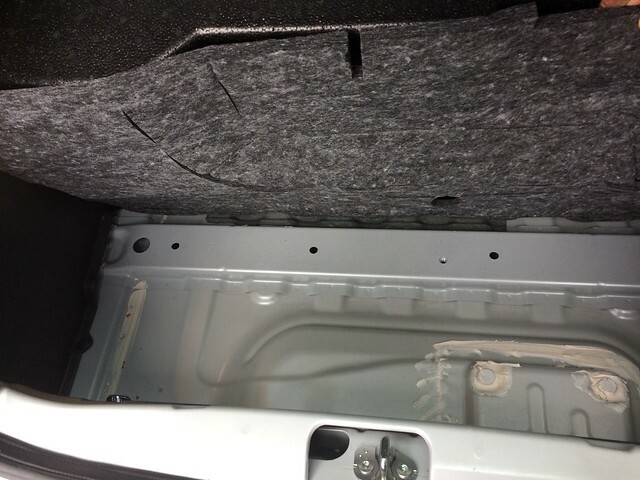 There are two mounting points on the inside of the cargo area, inside the red ovals. I use the mechanism that secures the seat upright, with a strap through it (blue ovals), to "secure" mine. That's all I really have a decent answer for. Hopefully someone knowledgeable can chime in with solid answers to your other questions, but I wouldn't hold my breath. In the era of plentiful roadside service, no hardly anyone seems to care about spares.... until they get a flat while out and about. Thanks for your help on the tie down locations. I'm planning on trying one of the spare tire kits from Ebay to see if it works on our cars but I am a bit nervous that it is a 14" rim. 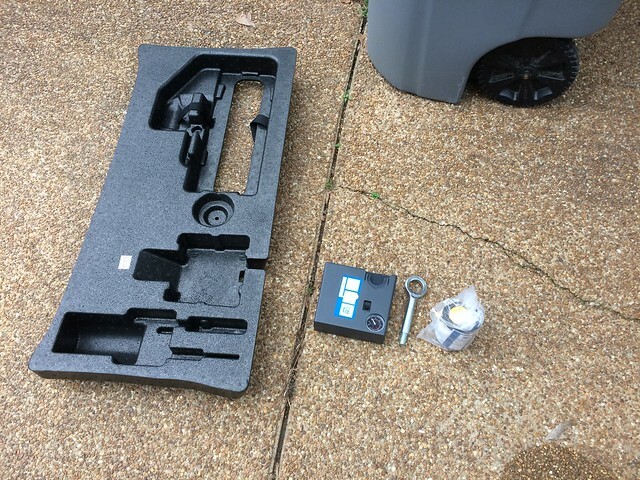 It appears the calipers are the same part number as the ICE version so I'm hoping it fits. I'll post any updates on if it fits or not or if a spacer is required. ... but I am a bit nervous that it is a 14" rim. It appears the calipers are the same part number as the ICE version so I'm hoping it fits. 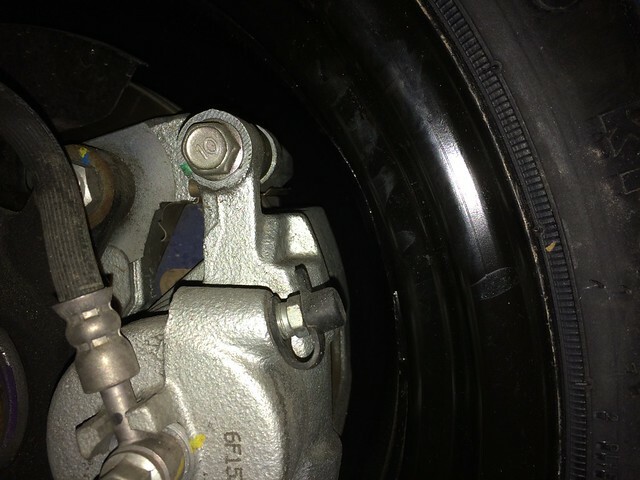 ..
Calipers may be the same but the hub face may be in a different location. Something is up with the different wheels front and rear. What happens when the 14" doesn't fit? The spacers are a good idea! Just remember lug nut thread engagement. And it must be on the rear, as you said. London has a solution. A temporary solution, as would be your spacer/spare idea. I had one slow leak in the 4 yrs of ownership and I was able to see that leak coming and made plans to get to a tire shop. AAA - $114 per year, 2 people, 3 cars, Up to four 100 mile tows per year, free delivery of fuel for my gassers, 'extrication' for when I slide on the ice into the ditch, locksmith service, spare tire service ( for her in the cars that have a spare. ( Plus you can help friends and family,,,, don't tell...). (A much better value than Onstar with their Basic plan, which now has a different name, and was about $200 per year. All I want is the basics a BEV owner needs. They don't offer that. But,,, my Remote Precondition function still works on the app! Norton thanks for your advice. 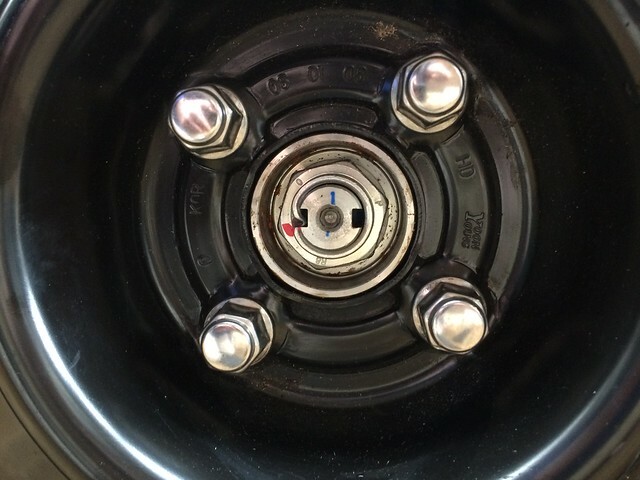 I ended up ordering a spark jack and tire tool with carrying bag as well as a spare tire from a Chevy Cobalt which happens to have a 15" Rim with the 4x100 bolt pattern (not all Cobalts had this bolt pattern though some had a 5 lug setup so if anyone goes this route do your research.) 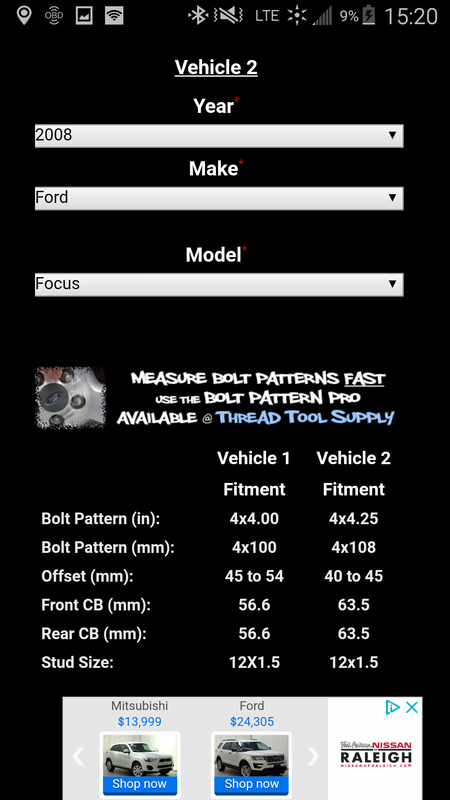 The Cobalt stock wheel size is: 6Jx15 ET42 with a 195/65R15 tire with a 57.1 center bore. 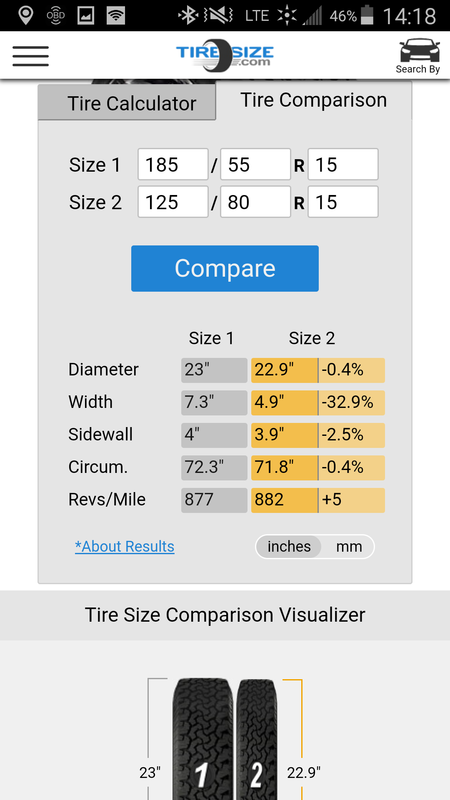 Compared to the Spark EVs Front: 6Jx15 ET45 with a 185/55R15 tire and Rear: 6.5Jx15 ET54 with a 195/55R15 and a 56.6 center bore. The only issue I see may be the offset being 3mm less. I will confirm if this is an issue when I receive everything and test it out in the next couple of weeks. 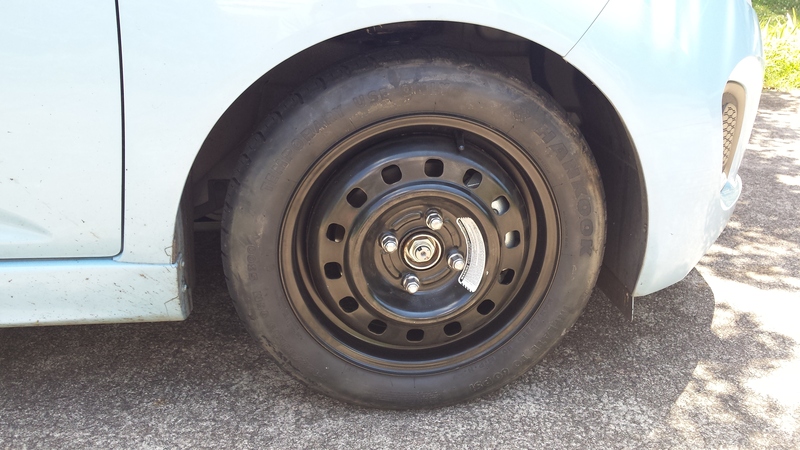 I opted for the 15 inch rim because it would be easier to have a rim that can go on the front or rear in case I'm stuck somewhere changing a tire and I didn't want to take the extra time to swap wheels. 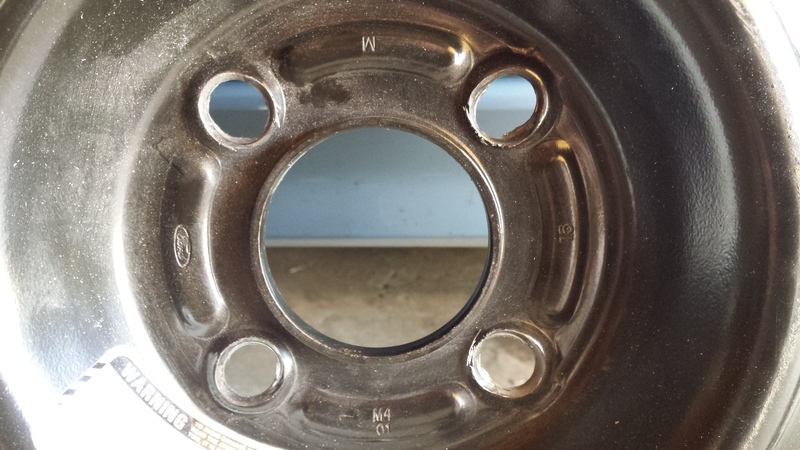 The spacers are a bit of a concern for me too if they were going to have to be over 5mm due to stud length and what is required to install them. I do think closing the rear cover is a good point that I did not consider. I'm hoping I can just keep the tire partially deflated so it fits since the car will still have the inflation kit in case of a flat tire. I've had to use a spare only three times in over 2 decades of driving but was happy when I had it so I could get it changed and back on the road. I always assume worst case scenario and being somewhere where I can't fix it and have to wait for a tow truck to tow me to a tire shop that may be closed or not have a replacement tire on hand and have to wait for the shop to open or order a new tire. With this being a city/commuting car it somewhat relieves that stress for me but having the spare gives me that extra peace of mind. 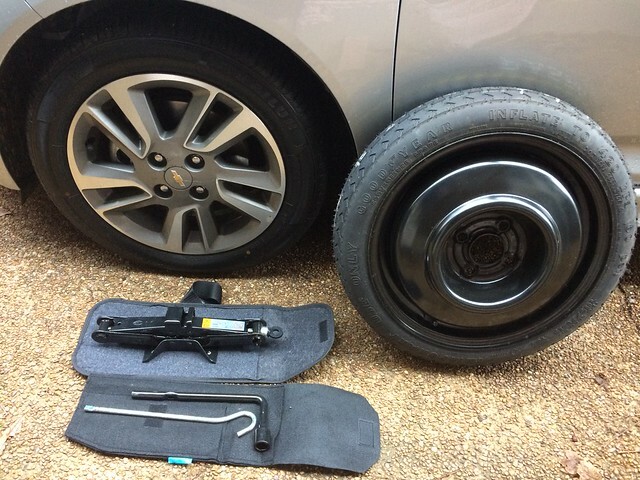 The road side assistance you mentioned does not seem like a bad option and I can see why many have and will choose that as their only option in the case of a flat tire. I'll post photos of everything that I was unable to get photos of for anyone else doing this research. I also purchased a 2011-2016 Chevy Spark Jack and lug wrench set. Photo of how close the bore is. This photo is with it installed on the front. Photo from the back showing plenty of caliper clearance. 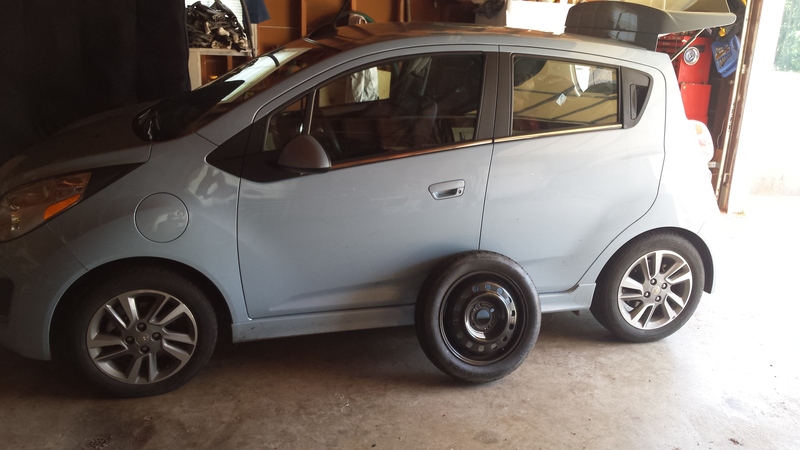 The jack and lug nut could fit where the EVSE goes nice and snug but the tire would not fit with the foam in place. 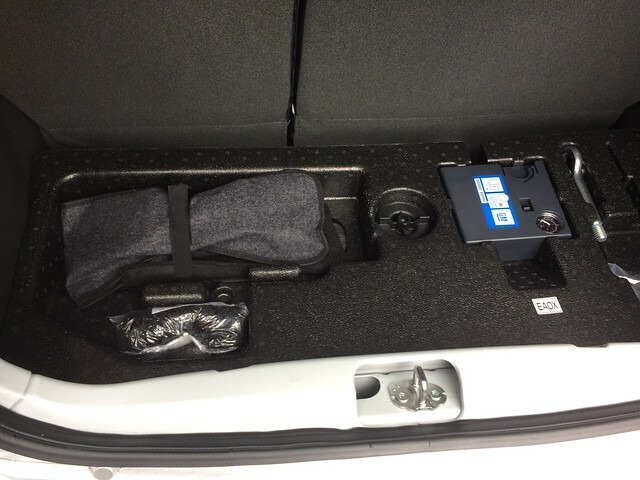 This is the trunk with the foam insert removed, sound absorbing mat still installed and the floor cover over that. 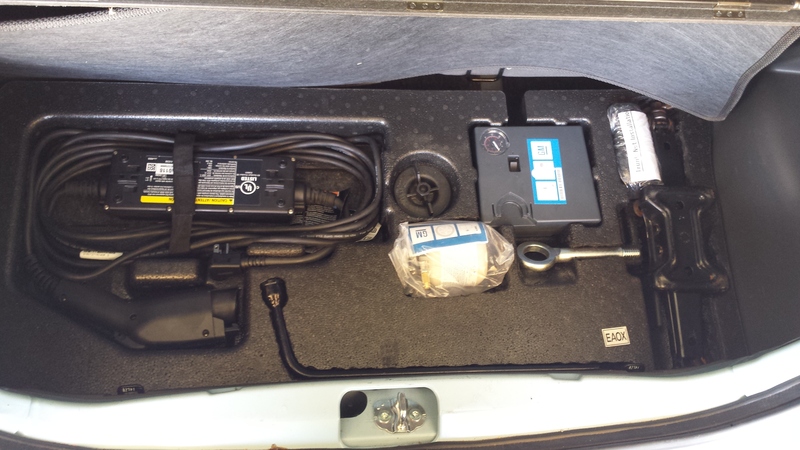 Removing the foam thing alone gives you another ~4" of trunk depth. 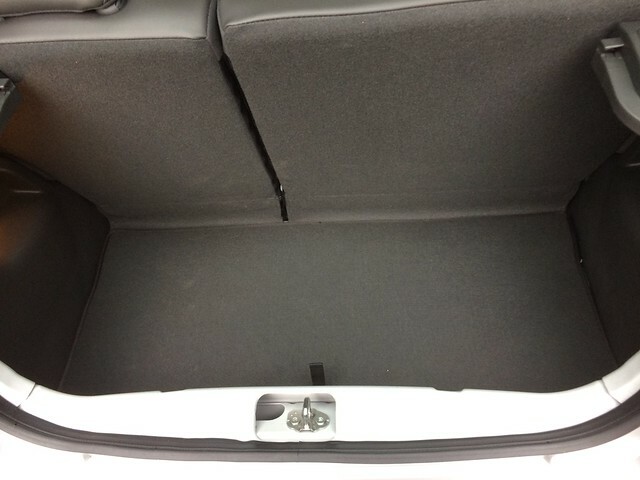 The cover is about an inch or two smaller than the floor but the back fabric part of the seats covers this gap nicely. 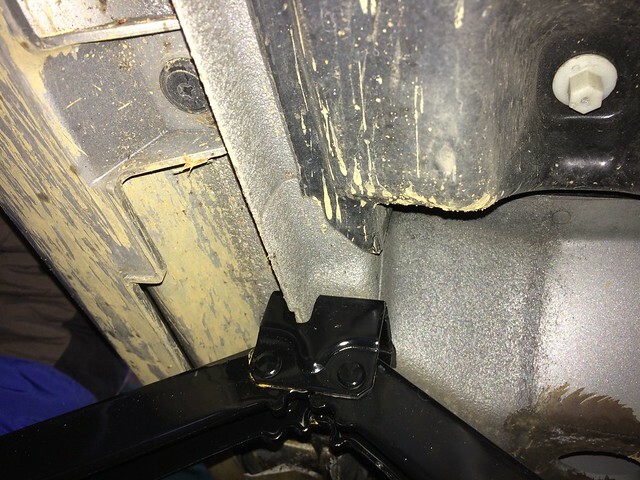 Spare tire strapped to folding seat anchors and the lid closes. I did deflate the tire when attempting different installation places but it appears it will fit in this configuration fully inflated. 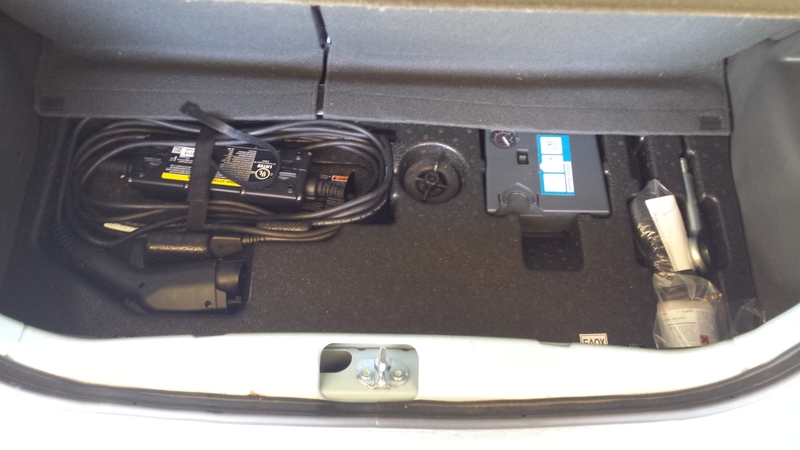 Spare tire installed, and storage bin with air pump, jack, tire iron, jumper cables, ice scraper, emergency blanket, extra headrest where booster seat is installed and snow/ice windshield cover. It would be neat if there was a threaded anchor within the back of the 60 portion of the seat so a strap wouldn't be required. I hope the photos can help others.